Hi friends! We watched our Christmas Parade yesterday from right here in our apartment. tee hee! That was a new experience. Small town fun. As promised, I am sharing my progress with you. I have the girl poodle done. Yay! 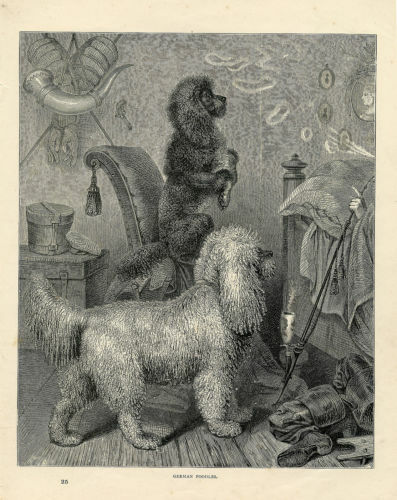 I have a very nice start on the boy poodle and will keep stitching on him when Madeleine is away from home. Well I finished listening to To Be Where You Are. Darn! With a book this good, you just do NOT want it to end. Did you know Jan Karon (the author) is 80 years old?!? Whatever are we going to do without more Father Tim stories? I do believe Jan is my all time favorite author. I have begun working on my mom's Christmas ornament. It will be an angel this year. Can't wait to share this sweet one with you. I hope you have a wonderful week my friends! Thank you for taking time to stop by and visit me. Hi friends! 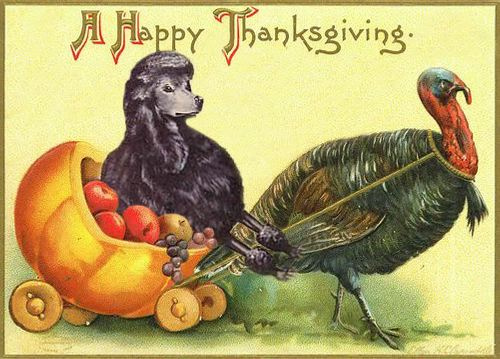 Did you have a wonderful Thanksgiving? I do hope so. I did. All three of my brothers and I were together at my mom's house. Such fun and laughter! Thank you for your kind compliments on Murphy's new coat. Just so you also know, he is improving with the eye drops. He waits patiently for me to do them now. He finished up the Pupperoni, so we moved on to freeze dried beef liver. Man, does he love that! I still have to pin him between my shins, but he behaves for the drops. 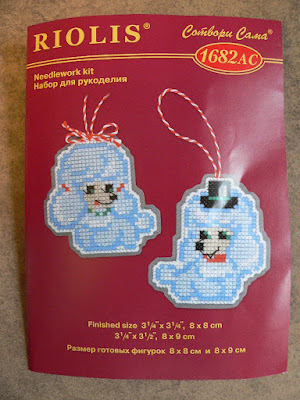 I finally took a picture of the Riolis poodle Christmas ornament kit that I had waited several weeks for from ABC Stitch. Is this NOT adorable?! I can thank Carol (no blog) for telling me about this! I hardly ever allow myself new chart or kit purchases. Honest, it is RARE, but these I had to get. 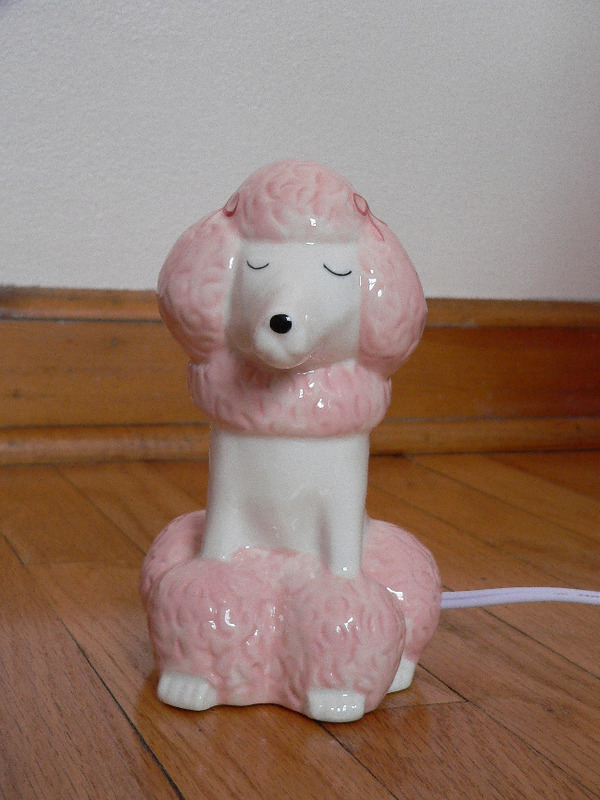 I have good progress made on the girl poodle. I can only work on these when Madeleine is at University or working, since these are to be for her this year in her St. Nick's stocking. While I was on the ABC Stitch site I found a second kit in the new releases. This is also a Riolis kit. I literally gasped when I spotted this one. It is another Russian Orthodox icon. 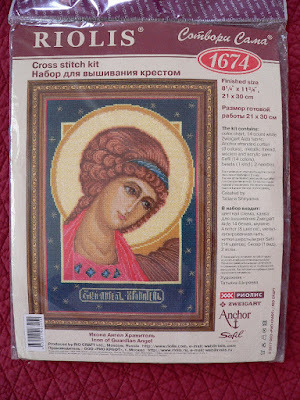 I have not stitched an icon for several years now, but I have been praying for a guardian angel icon. I have been searching for a guardian angel icon for more than a year actually. It is hard to find one when you want one in the Russian style and your first language is NOT Russian and you are doing searches and using translation tools and you know it is not going right. I gave up. And then.... when I was not even looking, I found this. I am so very happy with this kit. I plan to stitch this in 2018. I will NOT begin it until I have completed BBD AotH though. 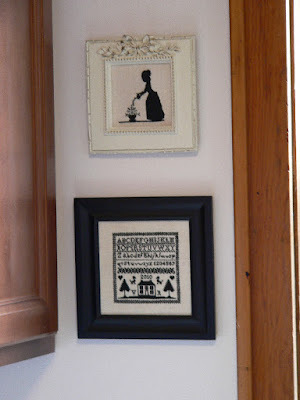 After Christmas ornaments are stitched and after the valances are all made, I am getting back to that. After, after, after. sigh. 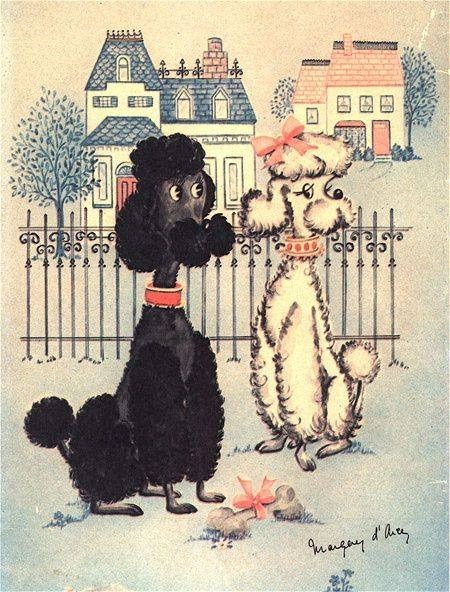 Well, I want to thank you Carol, my follower who told me about these adorable poodles in the first place. If you had not, I would not have this guardian angel kit! I no longer have my garden since moving in this apartment. 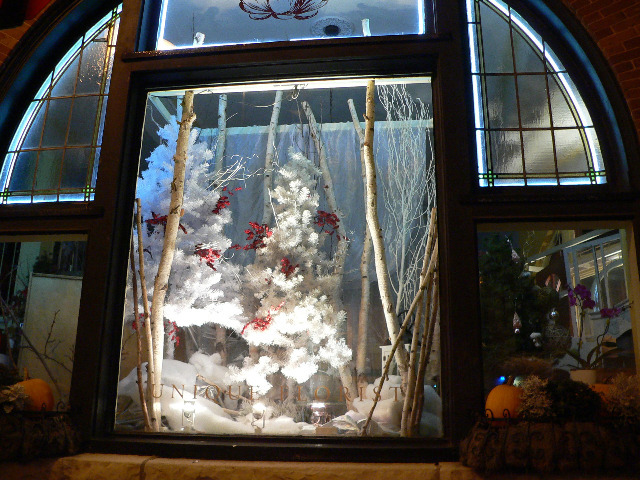 We are quite fortunate to have a beautiful florist that is diagonally across the street from us. I was going to say kitty corner from us, but I did not know if any of you say that. Is that probably a regionally said thing? Do you say that? Have you heard of that? Anyways, she puts such lovely displays in her window boxes and planters and windows.I took this picture the other night of one of the big windows. Not the easiest to see, but I tried. We get to watch the Christmas Parade Sunday night sitting right here in our apartment! Woo hoo! Such small town excitement, right? 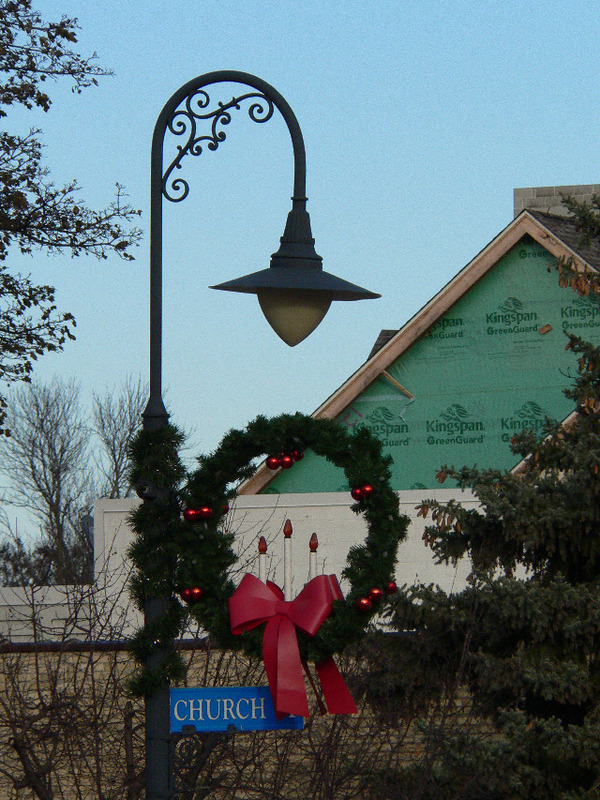 Now that we live in the exact center of our village, the little Christmas Parade route goes directly past our apartment. And since we live upstairs, we just need to set our chairs up in front of our windows and we are good to go! Only downside I see, is that we won't be catching any candy. Ha! I would rather be warm!! I hope you have a stitchtastic weekend my friends! I plan to. I have two ornaments stitched for friends, but I cannot show you! I need to finish them yet.I will show you Madeleine's ornament as soon as I get it stitched. 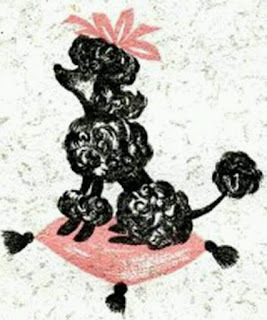 I should have the girl poodle done tomorrow while Madeleine works. Hi friends! I knew what I was in for, but I did it anyways. Do you know what this is? Yes. That would be a free pattern for a dog coat. I decided to make a dog coat for Murphy. HA! That is what the pattern looked like after I tried to lay it on his back a few times to size it up. I had to make a few adjustments to the pattern to make it fit his body size. 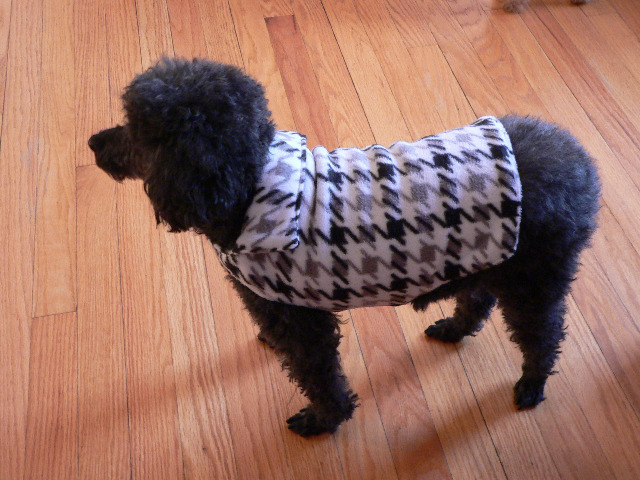 After I actually made the real fleece coat do you wonder if I could get the thing on him without getting bit? Do you wonder WHY I am even doing this?! I WONDER WHY I AM EVEN DOING THIS?! I did it because Murphy was groomed on Tuesday and he shakes and shivers in the cold. We do live in Wisconsin!! I DO love grumpy, 'ol Murph. We have been going through a lot with Murphy actually. One week before we closed on our home sale, his left eye became very cloudy very, very fast. We made an appointment with the veterinarian and took Murphy in. 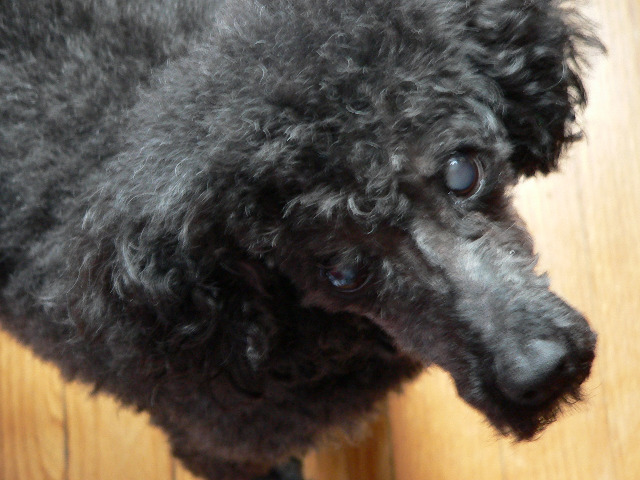 Unfortunately Murphy's left eye has rapidly progressed with cataracts. Both eyes also had uveitis, an inflammation that was causing pain and eye redness. What to do? Mama has to wrangle Murphy twice daily with eye drops. Lord help! I just stared at the vet when he told me that one. He suggested muzzling him or using treats to get it done. Well I knew muzzling him was not an option. Not twice a day every day for the REST OF HIS LIFE?!? NO. That is not right. Treats it is. Home Murphy and I went. Brian went off to get the drops and treats. He came home with the drops and Pupperoni. Now we have only ever given rice cakes as treats in this house. That started because of our dear Mabel. She tended to gain weight and rice cakes won't let you gain weight. Henry and Murphy go wild for these Pupperoni treats! I do NOT think they are very good for them though. So after this bag is gone we are switching to freeze dried beef liver. I know Murphy gobbles that up too because the vet offers that as a treat after the appointment is over. I am getting the eye drops into Murph's eyes. I have to sneak up on him. (Not always easy to do!) Then I quickly pin his neck between my shins, just above my ankles.See what I mean about wrangling poodles?! He actually just stays there and waits now. I just say treat once or twice and he stays still while I place the drop in each eye.Then I immediately give him his Pupperoni. Henry gets a very small piece too. This happens twice a day. Such fun! NOT! And I am actually Murphy's favorite person still!! 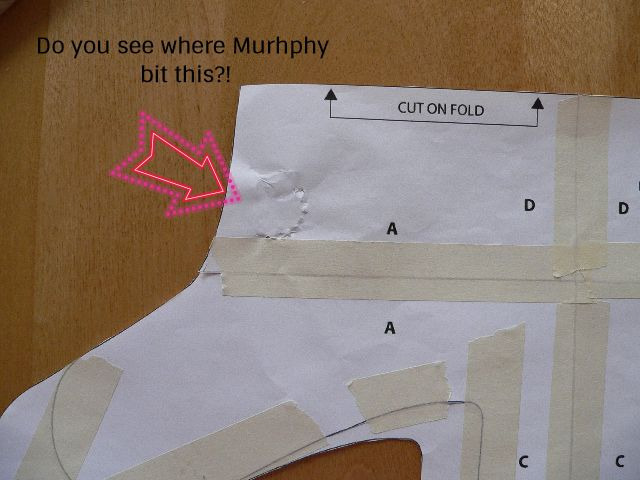 So our Murphy will go blind. He can barely see out of his left eye right now the vet says. The eye drops will make him comfortable and slow down the progression a bit in the right eye. Murphy is 14 years old. The bloodwork we just had done shows he is otherwise healthy. So we will just take this as it comes. I will share a bit of stitching with you next time my friends. My order came in from ABC Stitch on Friday finally! I began stitching the ornaments for Madeleine on Saturday. 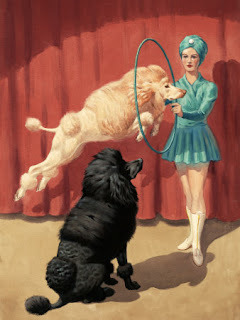 Yes, there are two poodles. I have to stitch them when she is not around. Thank you for stopping by. Have a super week! 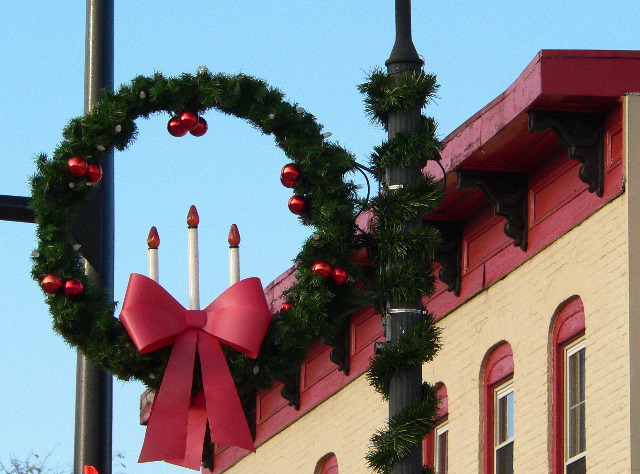 These are the wreaths decorating Historic Downtown. That is our apartment up there. These are how the lamp posts look. 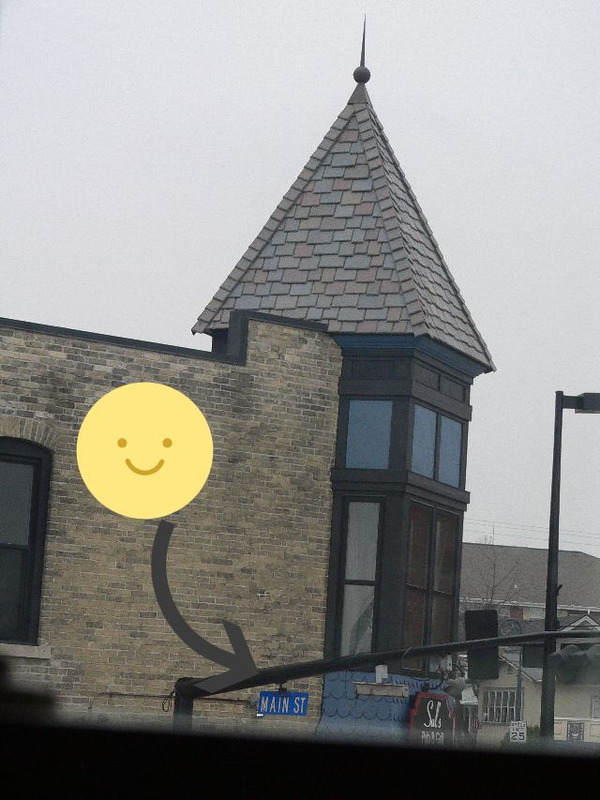 This is across the street. Hi friends! Today I am sharing with you two surprise presents Brian has given me since we have moved into this apartment. 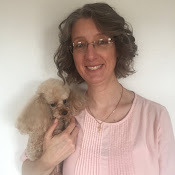 First, I must explain that since Murphy is 14 years old and going blind, we have used a night light in our bedroom, where he sleeps in a bed on the floor at night, since we have gotten him. He won't lay down to sleep without a night light. So a few weeks ago Brian was out running errands which included Target. He came home with this night light. An upgrade for me or Murphy? Hmm. She is adorable though, right? 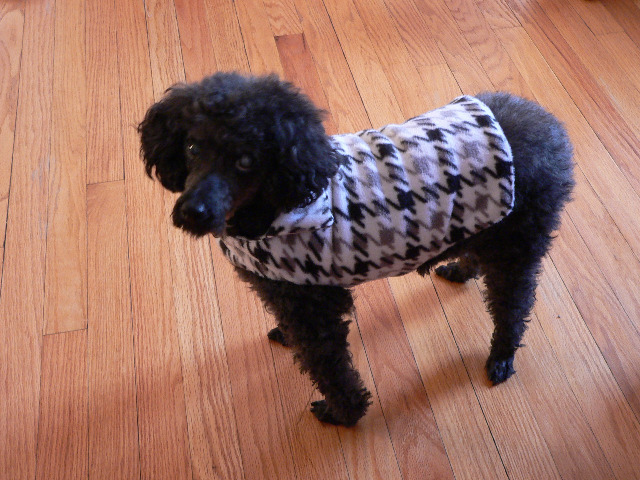 I am sure they did not make these for half blind 14 year old miniature poodles or for 48 year old women, but hey! The second gift is also a winner. This one left me stunned. I refused to accept it at first. Brian insisted. I am very much a saver and penny pincher, that is why! 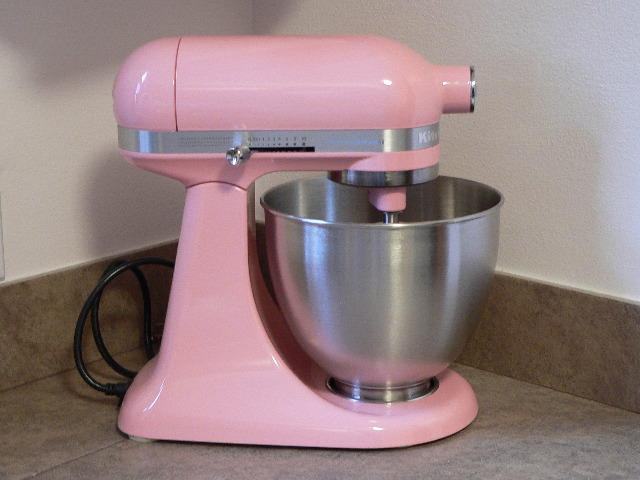 He says we are going to sell my old white Kitchen Aid mixer on Craigslist. The one we got as a wedding present 25 years ago and still works beautifully. This one is has my name written all over it he says. He says, "You should see your face when you look at this mixer!" He also got a smaller one because our kitchen is smaller. I hope that is not a problem. I think it may mean I can no longer make a double batch of chocolate chip cookies. And this gang loves their chocolate chip cookies! Brian says we will deal with it. The last audio book I finished was Agnes Grey by Anne Bronte. Have you ever read this book? I liked it. I find the actual lives of the Bronte sisters very interesting. In an effort to save her family from poverty, a young woman takes employment as a governess and discovers the great difficulties, instability, and even abuse that accompany her new position in Victorian society. Based on Brontë’s own experiences as a governess, Agnes Grey is a poignant tale that explores the repression of women as well as the coming of age of a young and memorable heroine. I am now listening to To Be Where You Are by Jan Karon. I absolutely love this book. I love every book by Jan Karon. 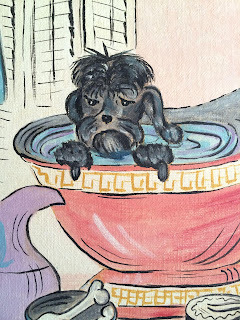 I know I am going to go back and LISTEN to the whole Mitford series. The books just make me feel good! And laugh. How many books make you feel really good? I am still stitching on Christmas ornaments. Maybe some sneak peaks next time. Have a wonderful weekend my friends! I am so glad you stopped by! Hi friends! Have you seen any snow yet? We had just the smallest amount of flurries on Friday. Nothing much. That is fine by me! 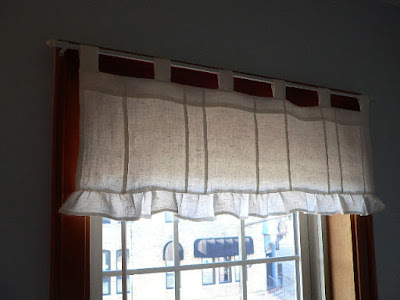 I finished the white linen valance for the boys' room. I was not so sure about the ruffle on the bottom. I think I made it slightly too rufflie. I am not taking it apart and redoing it however! It does not bother me that much. I randomly spaced 1/4" pin tucks across the valance width. 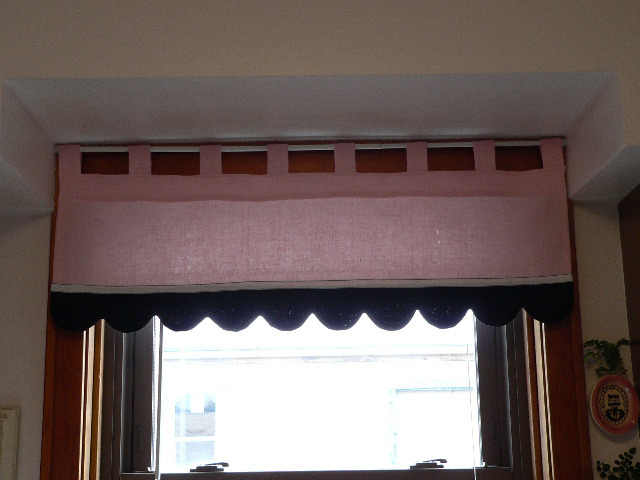 I made this valance like I did the previous two. I see something I like on Pinterest and just study the picture and kinda figure out how to make it on my own. I have had this white linen in my stash now for years. The guys like it. They seem to like whatever window treatments I make in their rooms. This is a lot less exciting than the rainbow dinosaur window valances I remember making when they were very little. 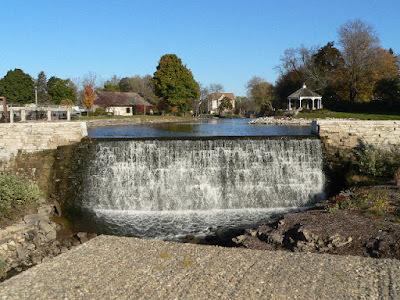 This can be seen right out the boys' bedroom window. I am stitching a Christmas ornament. (Not the kit I was waiting for. Still waiting!!) No pictures there. I also have more sewing to share with you next time. I can't help myself. I know I said I was going to do stitching now, but, well, I can't stand the state of undoneness around here. So I am also working on a few things. I hope you all have a great week my friends! Thank you for stopping by. Thank you for your wonderful comments. I enjoy reading them. Hi friends! Thank you for your kind words of encouragement you have left me. Your comments brighten my day. It has turned cold here. Frost every night. 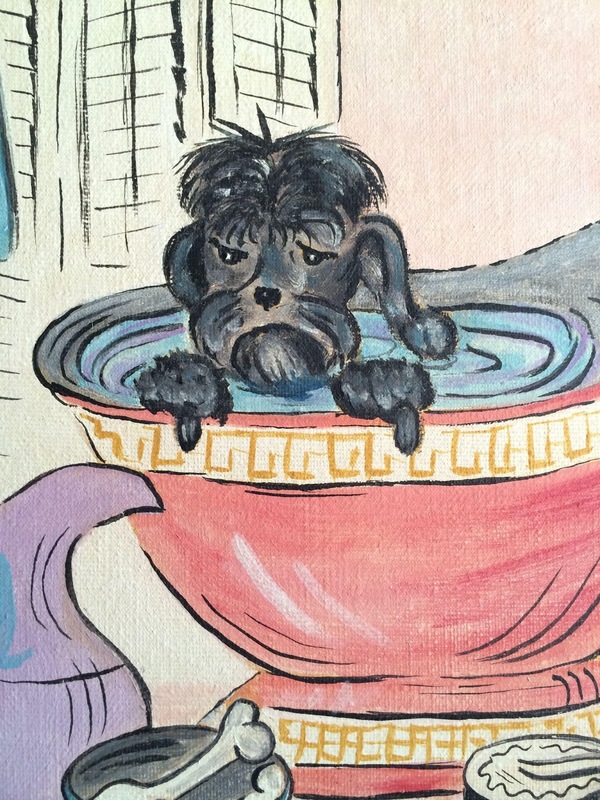 Shivering poodles every morning. I wish I could get a sweater on grumpy, old Murphy, but I may not have fingers left after the experience. Here is the linen valance that I completed for the bathroom. Does it look familiar? 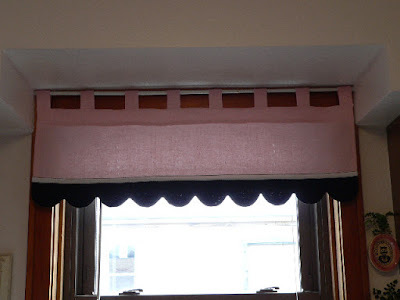 Yes, it is the same as the kitchen valance, just different dimensions. 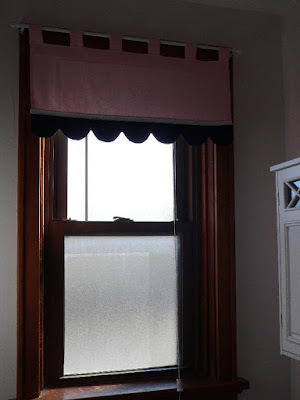 The scallop template for the kitchen did not work for the bathroom window. So I had fun figuring out the scallops two separate times!! NOT! It's done now though, and I am pleased. I had the pink linen in my stash for years. So that is always nice and a benefit! I am behind in telling you about the books I have listened to. 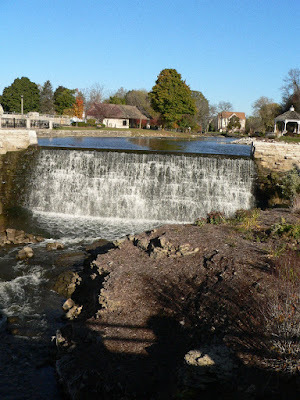 Back before we moved, I finished listening to Love and Other Consolation Prizes by Jamie Ford. I have not been disappointed by one of Jamie Ford's books yet. This was not my favorite of his, but still good. I am finishing up the last valance I will be sewing for a while. A white linen one for the boys' room. 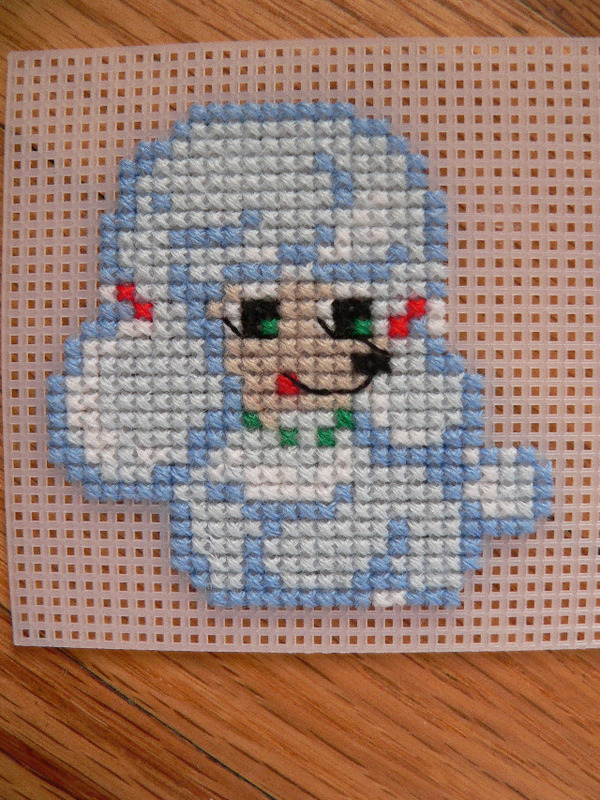 Then it is on to a few cross stitch Christmas ornaments. I ordered a VERY special Riolis kit from ABC stitch two and a half weeks ago. It should have been here by now!! I need want it very badly. It is for Madeleine for Christmas this year. I give the kids ornaments every year for St. Nick's. Brian called them yesterday and asked where the order is? After being on the phone for 13 minutes!! !, he was told the order is "on invoice". Um, what? C'MON ABC STITCH LET'S GO!!!! Please ship it NOW! 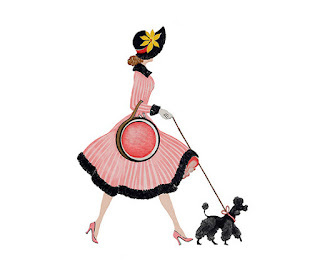 I hope you have a super stitchtastic weekend my friends! Thank you for stopping by. Hi friends! These waterfalls are one block away from our apartment here on Main Street. These falls give our little village it's name. 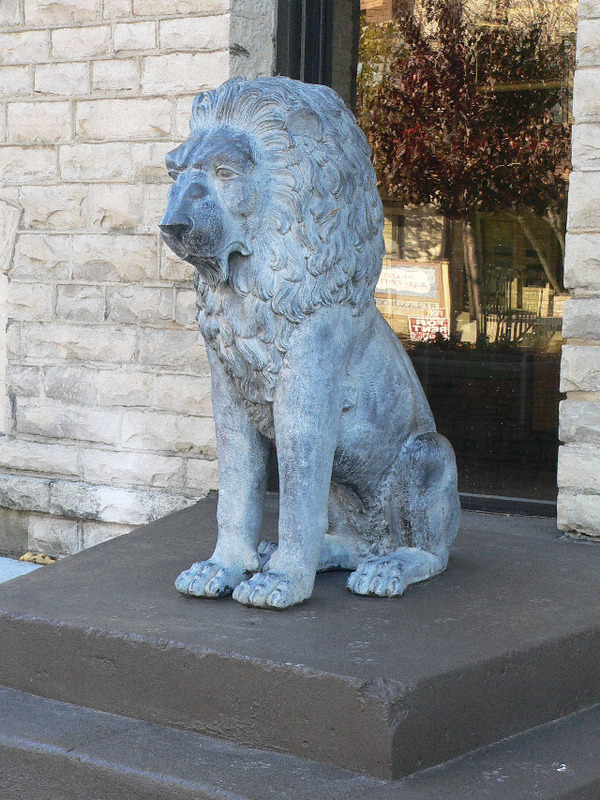 Here is a faithful friend who watches over the falls across the street. Thank you so much for stopping by today my friends. I appreciate each and every one of you. 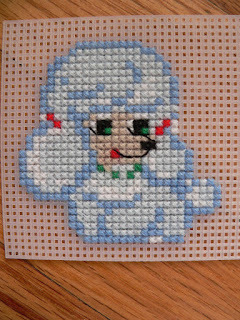 I know I have not shown stitching in weeks, I am sorry about that, I just do not have time right now. 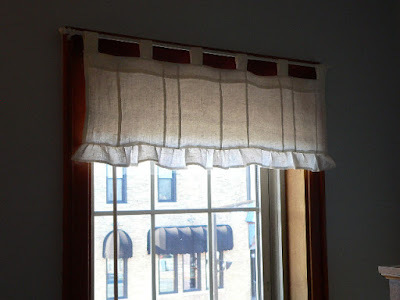 I am working on one more valance I think. Then I MUST stitch up a few Christmas ornaments! So hang in there if you are visiting for the stitching. It is coming! Have a super week my friends! 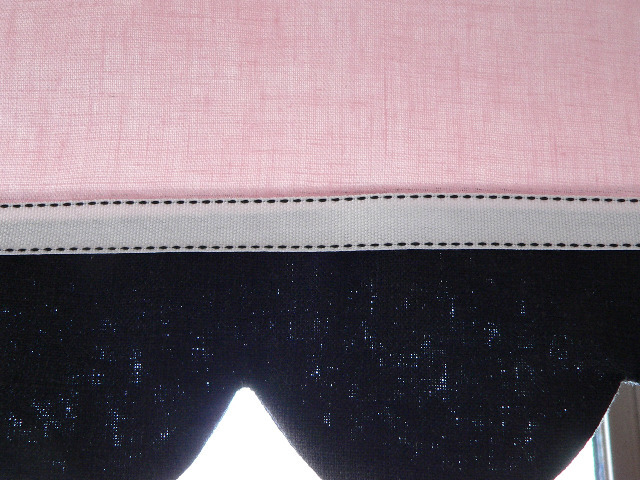 Pink and black linen! Hmm. I just realized I don't have a close up picture of this. Maybe you can click on it and see it up closer? 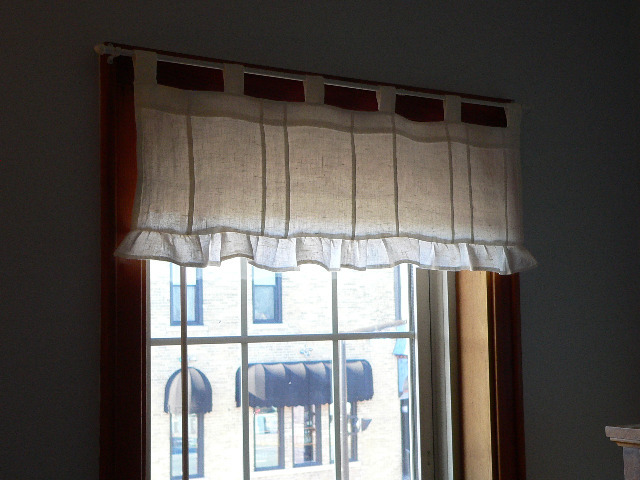 There is a lovely 5/8 inch white ribbon I found at JoAnn that I placed on the valance with iron on adhesive hem tape. Did you notice Mr. and Mrs. Kitchen? 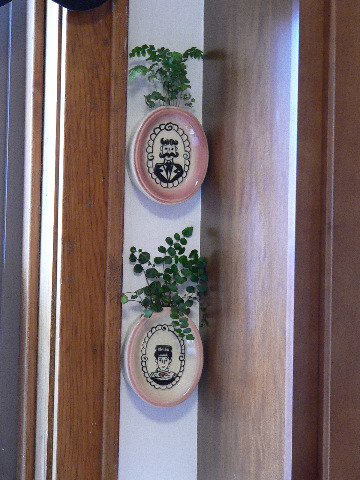 Are these vintage 40's wall pockets not darling?! I found them on Etsy. I love them. I popped some ferns into them. Yes, my same two samplers I had hung in our home on the left side of the kitchen sink there also. So there is your peek into our kitchen my friends. Things are coming along. I will be back next time with a bathroom peek! Ha!